Though predominantly active in photography and sculpture, the multimedia artist Jennifer Bolande has generated a substantial body of work that engages with the “objecthood” and cultural experience of cinema. Both funny and elegiac, Bolande’s art explores how movies make us feel, and how the form and the phenomena of film work on us in ways that are altogether separate from film’s narrative content. Bolande uses complex strategies of remediation and signification to comment on our changing relationship to popular media and its attendant technologies, many of which are on the verge of disappearance. I met Bolande in Philadelphia at the opening of her retrospective at the Institute of Contemporary Art (January 11 – March 11, 2012). The recurring tropes and the objects of her fascination – from stage curtains and marquees to projection screens and film stills – made me curious about the influence of cinema on her work. She met with me in her Los Angeles studio, where she was careful to point out that, for her, Hollywood feels as far away as New York. Side Show (Jennifer Bolande, 1991). Courtesy of the artist. Jennifer Bolande: Side Show (1991) was the first staged photograph I made. Prior to that I had mostly worked with found images. The scene, a kind of micro-spectacle, alludes to something happening off-screen, which seems like a cinematic idea. You can almost hear the sounds of the circus at a distance. Side Show is from a body of work that was oriented around a circus-y theme. Another is One Day (1991),which features a Fotomat, a one-day photo processing drop-off location. This was before one-hour photos; one-day was the fastest processing you could get. It’s hard to see, but there are arrows to drop your film off on one side of the Fotomat and arrows to go to the other side to pick it up. I was standing on the top of a hill and looking down on the Fotomat, which is very similar to the point of view of Side Show. You can see directional arrows on the pavement, and all of the little photographs inside. Like, if you were coming from another planet and wanted to know what humans thought was beautiful or worthy of documentation, it was all there in a condensed form, any day. I wanted to have that sense that you are coming from afar, looking down on it, a slight aerial view. Like a lot of my work, these pieces hover around things that are on the periphery of attention or on the brink of extinction. J. Louise Makary: I found Side Show to be oddly moving. Because you’re using some cinematic devices – lighting, staging, off-screen space­ – which produce a sense of heightened emotion. You’re almost making a character out of that little stake. Your titles often add another layer to the work: “sideshow” is a circus term, but it also seems to refer to a little figure to the side that is holding the apparatus up. JB: The stake is a small but crucial element supporting the entire tent — so this little “sideshow” is of central importance. It’s not just an alternate center though. The stake was hammered right at the place where the two cones of light intersect. I am really interested in where things meet, in seeing or articulating the precise point where one thing intersects with or turns into, another. JLM: There’s potential for something to happen, for you or the viewer to do something. It’s a pregnant moment, but not a decisive moment — it’s been staged, like in a narrative film. JB: There’s a kind of framing of gestures and movements in my work, which may have something to do with my roots in dance. My works are like frozen movies. 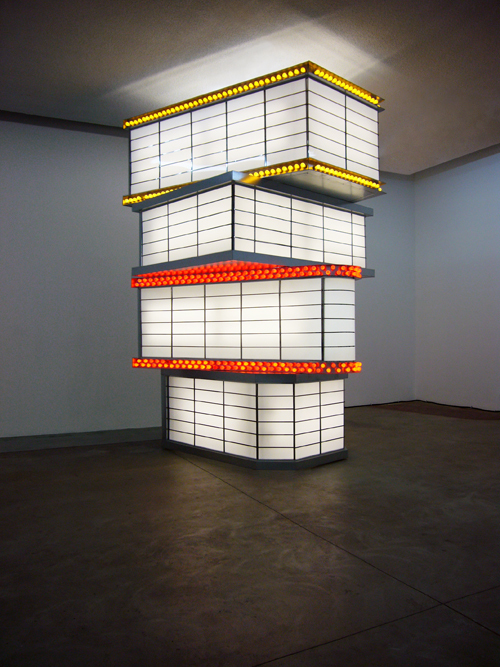 Tower of Movie Marquees (Jennifer Bolande, 2010). Photo credit: Maegan Hill-Carroll. Full interview at INCITE Journal of Experimental Media.